There were already three classifications of this sparkler that use grapes you’ve probably never hear of, traditional Cava, with 9 months aging in bottle; Cava Reserva, with 15 months; and Cava Gran Reserva, with at least 30 months in bottle. This new classification goes to a whole new level, with strict rules that require hand-harvesting, limit the yield per hectare/acre, require minimum aging of 36 months in bottle and vinification on the estate, and can only be made in the Brut/Ultra Brut style—no sweet wines need apply. And the base wine must be submitted for testing and approval, although frankly I don’t know by whom or what for. 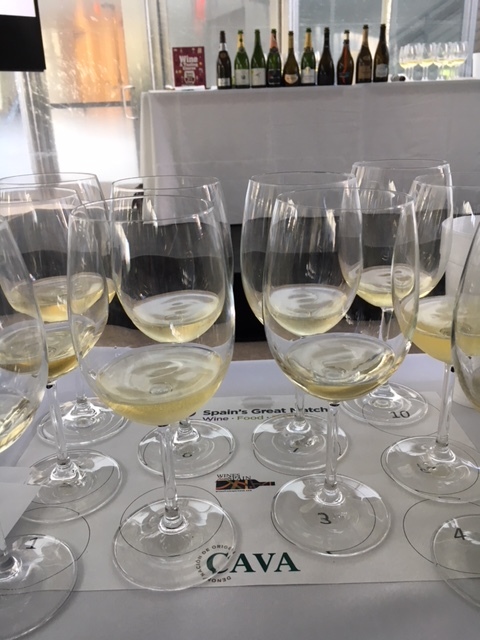 Cava was already doing very well in the USA, as we Americans have come to know and enjoy this unique wine, with recent import growth of more than 50%. Most of it comes from the Cataluyna (Catalonia) region, recently the subject of some real political upheaval, a failed secessionist movement, and the “firing” of its leaders by the central government, but let’s leave that to political scientists and pundits—we’re here to talk about wine. The region is ideal for sparkling wine, with the Pyreneés to the north giving the area cool nights that preserve acidity in the finished wine. All Cava wines are made in the “traditional” method, with the second fermentation of a base wine in bottle with some added sugar, yeast and grape juice, and many of them are already made in the “Brut nature” method, with no “dosage” at the end (dosage is a little unfermented sweet juice added at the end just before corking, to take the edge off the wine’s dryness). Most Cavas come in various combinations of three main grapes you may never have heard of: Xarel-lo, Macabeo, and Parallada, with occasionally some Chardonnay, Pinot Noir, Monastrell, and Garnacha Tinta tossed in. But make no mistake, these are lovely, nuanced wines, the best of which hold their own against some of the best Champagnes available, and in my view far outclass in complexity the vast majority of Prosecco, which seems to be the sparkler of choice at parties and gatherings for the last few years. Just like Champagne, many Cavas are aged on the lees, dead yeast cells whose shells “crack” and give the wine that lovely toasty, brioche-like quality. The new Cava De Paraje Calificado classification was just announced in in 20166 and the first vintage will be this year, with just 12 growing sites approved at this moment. These are surely wines of terroir! Vilarnu Brut Reserve NV: 50% Macabeo, 35% Parellada and 15% Xarel-lo. Rich, aromatic and sharp. Mascaró “Pure” Reserva Brut Nature 2013: Almost Sherry-like aperitif wine, with 80% Parellada and 20% Macabeo. Comes from a region known more for old-vine red wines. Alta Alella “Bruant” Reserve Brut Nature 2015: Organic wine with no added sulfites added, named for the Bruant bird (no idea, I’m a dog man), from a 100% clone of Xarel-lo called Pansa Blanca. Richer and softer than most Brut Nature wines. Avinyó Blanc de Noirs Reserve Brut Nature 2012: 100% Pinot Noir, with 12 months of bottle aging from a very small estate producer. Not my cup of tea but you might very well love it. Juvé Camps Gran Juvé Gran Reserva Brut 2011: Doesn’t qualify for the new classification because the grapes come from four different sites, but a lovely wine nonetheless. Little bit of dosage and quite a combination—Xarel-lo, Macabeo, Parellada and Chardonnay in equal proportions. Even though it’s not bone-dry I really like it. Gramano Imperial Gran Reserva Brut 2011: A biodynamic wine, totally hand-riddled*, aged under cork and not bottle cap for some reason (I’m not sure what difference that makes), with 505 Xarel-lo, 40% Macabeo and 10% Chard. Really nice. Torelló 225 Gran Reserva Brut Nature 2013. 50% Xarel-lo, 29% Macabeo, 21% Parellada. Single vineyard wine. Didn’t make much of an impression for some reason. Finca Sabaté i Coca Reserva Familiar Gran Reserva Brut Nature 2012. If you can get through that name, and I barely can, this is really fine food wine, balanced and lovely, some fermented in in barrel and some in stainless steel. 100% Xarel-lo, and overwhelmingly my favorite of all of these Cavas. Freixenet Casa Sala Gran Reserva Brut Nature 2006: Single vineyard, micro-fermented, from a name you probably know, one of the two “first families” in Cava. Brut nature, 75% Parellada and 25% Xarel-lo. Codorniu Finca La Pleta Gran Reserva Brut 2007: The other name you may know, and the oldest wine producer in Spain. 100% Chardonnay, and a little too sweet for my skeleton-bone-dry taste, but something you should sample.